The instability in the Arab World is escalating. Syria is in a full-fledged civil war having claimed the lives of over 105,000 people. And most worrisome for America and Israel is al Qaeda is resurgent in Syria. Egypt is locked into a dangerous stalemate between Islamists and the military. No peaceable solution is in sight. Massive unemployment and debt are strangling the country, and there is no quick-fix solution on the horizon. Iraq Iraqi security forces launched a major offensive against insurgents in the country’s northwestern and western regions on Sunday. Iraq is deteriorating, and little can be done to stop the violence between Sunni and Shia Muslims . Shia Muslims are the majority of the population. Yemen is a very serious concern for the United States… Yemeni security forces remained on high alert amid fears of an imminent attack by al Qaeda in the capital, Sana’a, after the US and Britain withdrew all embassy staff and again urged their citizens to leave the country. Libya is not so much a country anymore but a name on maps that is home to dozens of militias, tribes, and desert nomads, all seeking to assert power. Libya has not a unified voice, and is on the brink of its own civil war. Jordan is in a much-weakened state; the Monarchy is constantly scrambling to maintain political power. The Muslim Brotherhood has a strong presence in the country. Jordan stands at the crossroads of the regions conflicts: Shia versus Sunni and Arab versus Israeli. It has a peace treaty with Israel. Bahrain is an island nation close to Iran (geographically), but led by a Sunni monarchy that rules the majority Shia (Iran-friendly) citizenry. There is continued protests and unrest. If it were not for Saudi backing, Bahrain would experience a coup d’état encouraged by Iran. The Sinai Peninsula (a desert that separates Egypt and Israel) has become a mini-Afghanistan. The Sinai Peninsula has been a haven for militants and terrorists for decades. A barren desert, the Sinai is very difficult to control. Saudi Arabia is relatively stable but there are worries. Saudi Arabia is in the midst of a historic generational change of leadership; the Saudi leadership are in their 80’s. Who will lead this powerful nation in the next 3 to 5 years and beyond will be watched intensely. The prophecy found in Genesis 16 continues to tell us not to expect peace anytime soon: “You shall name him Ishmael, for the Lord has heard your misery, He will be a wild donkey of a man; his hand will be against everyone and everyone’s hand against him, and he will live in hostility toward all his brothers”.—verses 11-12. The Arab people are descendants of Ishmael—The Biblical story of Abraham and Ishmael gives us clarity as to why there is so much upset in the Middle East. 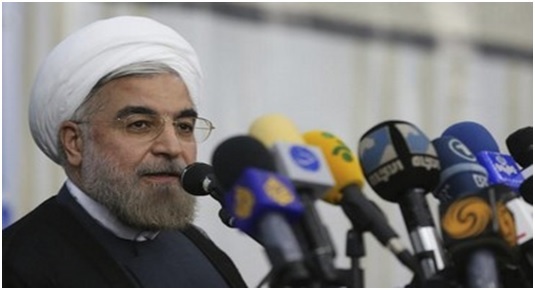 “Rohani’s true face has been exposed sooner than expected. Even if his comments will quickly be denied – that’s what the man thinks and that’s the Iranian regime’s game plan,” asserted Netanyahu. “Diplomatic relations between Tehran and Washington will improve after Iran’s new president assumes office Aug. 4, ending months of speculation over whether Iran and Washington will find accommodation in their nuclear standoff. In fact, in recent weeks both sides have expressed interest in resuming bilateral nuclear talks”. This is the latest report from Stratfor—the respected Global Intelligence Company. The nations of the world simply do not recognize that Israel is the “Apple of His eye”—God’s eye (Zechariah 2:8). Woe to the nations that mistreat her—even though she has her sins and faults. Zechariah 2:8-9: For thus said the LORD of hosts (after his glory sent me) regarding the nations that plundered you: Truly, one who touches you touches the apple of my eye. 9 See now, I am going to raise my hand against them, and they shall become plunder for their own slaves. Then you will know that the LORD of hosts has sent me.